I’ve written about femtocells here in the past - basically micro-cell antennas that users attach to their broadband network. They are used to fill in areas where coverage is weak or does not exist. It looks like this idea is catching on. With increasing traffic demands along with OPEX and CAPEX savings in mind we’re starting to see a shift in the deployment of small range cell base stations (what some are calling simply “small cell”). Looking at a recent ABI Research report that examines the ecosystem and outlook for LTE base stations titled “The LTE Base Station Market,” we see the uptake of small cells and remote radio heads (RRHs) as elements of the distributed base station. Operators will initially deploy small cell equipment as in fills on the pico and microcell layers, but will quickly transition to deploying them as a fundamental part of a network rollout. The number of LTE small cells sold (127,000) will surpass the number of LTE macrocells, forecast at 113,000, as early as 2014. Semiconductor suppliers are positioning themselves to participate in this market with TI, Freescale, Cavium, Mindspeed, and DesignArt among the manufacturers offering new “base station-on-a-chip” SoCs. 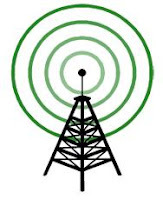 However, LTE base station revenues will continue to be dominated by macro base station revenue with small cell revenue of $1.09 billion representing only 5.2% of the total revenue of $20.86 billion in 2014 and growing to $4.44 billion or 23.9% of the total $18.60 billion LTE base station market by 2016. Equipment manufacturers have been quick to respond to this shift in RAN (Radio Access Network) architecture. Ericsson acquired BelAir networks as part of its “HetNet” initiative, Nokia Siemens Networks announced Flexi Zone, Alcatel-Lucent continues to expand its lightRadio™ portfolio and Huawei has announced its AtomCell products. We’ve been making the rounds with my youngest daughter who is a junior in high school. She’s interested in a college that has a strong Mechanical Engineering program. She’s not interested in going to a large university - she’s looking for something a little smaller. 3 hour ride so we leave early. Get to the school and find the admissions office. Admissions office staff tells us about our appointment with the Mechanical Engineering Department Chair. We get the name and “office” location of the chair and head over to the Engineering building. We get over to the Engineering building and find out the “office” is actually a small conference room. There are two other families with us. Two of the potential students are female and one is male. The department chair (at least I think he was the department chair but not 100% sure) shows up. The professor/chair spends 15-20 minutes talking about himself. The awards he has received, the grants he has. When he found out we were from Massachusetts of course he just had to tell us about all the time he had spent and great work he had done at MIT. So far, just a waste of everyone’s time. No real damage.... yet. It gets bad though when someone breaks in with a question. One of the parents asks about curriculum. He goes into a diatribe about how he is teaching the same courses as MIT using the “big thick classic books”. He mentions ABET but does not describe what it is or means. Other families are so lost. He then stressed over and over again about how much time students have to spend reading these classic textbooks each week. He indicated with his fingers (about an inch) saying “this thick” for each class. He says "this thick" and indicating with his fingers at least 10 times. Each time he does it is with a scowl on his face. He then tells us the problem with American students is "you are lazy" and “you will likely fail”. This time with a look of disgust on his face. Then we got more of the lazy American student language. At this point I cut it off and told him we had another appointment and had to leave. The other two families got up and followed us as quickly as they could out the door. I did tell them don't listen to that guy. 3 hour plus ride home with traffic. What a wasted day. Lucky for us my wife and I are both engineers and we were able to prevent some of the damage to our daughter. I cannot help but think about those other two families and those two 17-18 year olds whose dreams of studying engineering were likely destroyed in about 20 minutes by this guy. One of the families had a younger sibling and that kid has likely been damaged too. Nice work. Again, no names here. I am sending a link to this post though to the admissions director at that school. The Dean of the Engineering school called late this afternoon and we talked for a long time. Good honest discussion and he is going to be sure this does not happen again. I was impressed with his understanding and dedication to the program and especially the students. I feel confident the problem will be taken care of. You know I'll be checking! I spend a lot of time (it's 100% of my own time, not work) writing and I wonder sometimes if what I'm doing is having any impact at all. Today was pretty good! In my last legacy PSTN post I discussed how Synchronous Optical Network (SONET) is used to multiplex, transmit and then de-multiplex voice calls. Today, let’s take a look at how SONET is being used to transmit packet-oriented data (in today’s world - basically Ethernet). 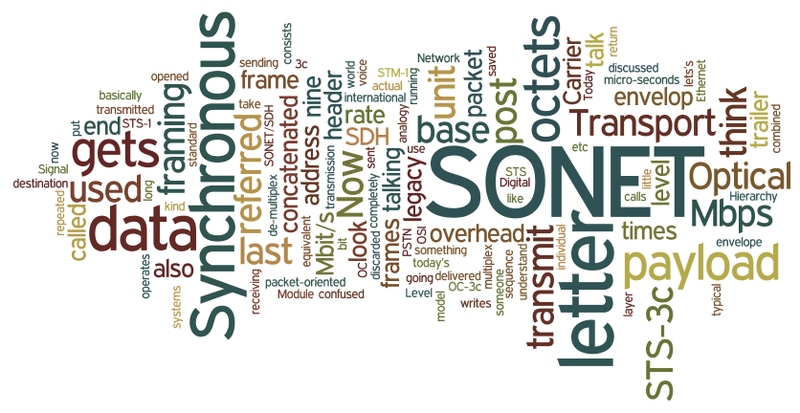 In that last SONET post we said the SONET international equivalent is called Synchronous Digital Hierarchy (SDH). Now, when we talk about data at the SONET/SDH level we’re talking frames (think layer 2 OSI model) and the base unit of framing for SDH is something called a Synchronous Transport Module, level 1 (STM-1) with operates at 155.52 Mbps. In the post I also said the base SONET standard bit rate is 51.84 Mbps and is referred to as Optical Carrier (OC) -1 or Synchronous Transport Level (STS) -1. Now, because we’re talking 3 times an STS-1 and it is concatenated (combined), the base SONET data framing unit (running at 155.52 Mbps) is referred to as a STS-3c (Synchronous Transport Signal 3, concatenated) which is also referred to as an OC-3c (Optical Carrier - 3c). Now that I have you completely confused (!) lets’s talk a little more about packet frames. A typical packet frame consists of a header, payload (the actual data being sent) and some kind of trailer. I like to use a letter analogy to understand what is going on - someone writes a letter (think of the letter as the payload or data). It gets put on an envelope (think of the envelop as the header and trailer for now). At the sending end the letter gets a destination address, a return address, etc and gets delivered. At the receiving end the letter gets opened, the envelop discarded and the letter itself saved and used. For an STS-3c framing unit, the payload rate is 149.76 Mbit/s and overhead is 5.76 Mbit/s. If we look at an individual SONET STS-3c frame - it’s 2,430 octets long. SONET systems transmit nine octets of overhead and then 261 octets of payload in sequence. This transmission is repeated nine times in 125 micro-seconds until 2,430 octets have been transmitted. Timing is critical here (that's why it's called synchronous) for communications across the entire network. Back from vacation today and my wife did a software upgrade to iOS 5.1 on her AT&T Wireless service iPhone 4S. Sure enough her indicator now reads "4G" (upper left hand corner) and she's getting some pretty nice bandwidth. Here's a screen shot after running the speedtest.net app. As a comparison, here's the same test run on my AT&T 3GS iphone. I'm also updated to iOS 5.1 but no "4G" for me on my older phone. Is it really "4G" on her phone? Well - no. It's running a 3G service called HSPA+ (sort of 3G on steroids - up to 56 Mbit/s downstream and 22 Mbit/s upstream) which AT&T is using to get over the bandwidth hump until LTE rolls out. I've written about 4G services fairly extensively - follow this link to read my older posts. Regardless, that's some sweet bandwidth. If you've got an iPhone 4GS running on the AT&T network, be sure you're up to date on upgrades. As for me and my almost 3 year old 3GS - I'm stuck in the "3G" world until I upgrade my phone. The 3GS does not have a HSPA+ radio in it. How can you check which iOS version you are running on your iPhone? On your phone select "Settings", "General" and then "Software Update". You should see a screen like the screen shot from my 3GS below. If you are not up to date follow the instructions on the Apple website. Here's another entry for what I've been calling the legacy Public Switched Telephone Network (PSTN) series. In my last legacy post we covered the European or “E” carrier system. Today, let's look at SONET. In the United States T-1 carriers have been replaced in many locations with Synchronous Optical Network (SONET) systems. Internationally, the SONET equivalent is called Synchronous Digital Hierarchy (SDH). Both SONET and SDH systems consist of rings of fiber capable of carrying very high bit rates over long distances. Copper has been replaced by fiber to inter-connect most Central Offices (CO’s) in the United States at bit rates ranging from the SONET base rate of 51.84 Mbps up to 39,813,120 Gbps. The base SONET standard bit rate is 51.84 Mbps and is referred to as Optical Carrier (OC) -1 or Synchronous Transport Level (STS) -1. SONET uses a synchronous structure for framing that allows multiplexed pieces down to individual DS-0 channels to be pulled off a SONET signal without having to demultiplex the entire SONET signal. We can look at a table of SONET bit rates. The OC-1 base is used for all higher level SONET specifications. For example, a SONET specification of OC-48 can be calculated by taking the OC-1 base rate of 672 DS-0 channels and multiplying it by the OC-48 suffix of 48. We can do the same calculation for the OC-192 specification. It is common to run SONET rings CO to CO with all SONET connected CO’s having SONET multiplexers that can demultiplex all the way down to an individual DS-0 channel level without having to demultiplex the entire SONET frame. 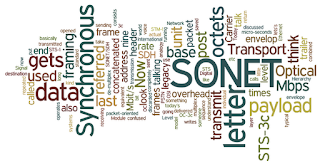 In my next legacy post I'll take a look at how SONET is used for packet-oriented data transmission (e.g. Ethernet).